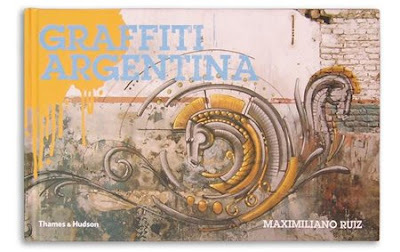 Next Friday 27th March will see the London launch party of Argentine author Maximiliano Ruiz's Graffiti Argentina book. Graffiti Argentina is the first book about the local graffiti scene, which in the last few years has become one of the most original and recognized in the world. This book traces the story of Argentina's vibrant but little-known graffiti scene in four parts – from the efflorescence of graffiti in the 1990s and artists' city escapades, to the underground use of tags, train graffiti and political paintings, and the sketches and designs that have come off the street to influence the whole visual culture of this exciting country. The events, organized by the Maximiliano Ruiz, will be focused on promoting Argentine Street Art along with the Graffiti Argentina book. 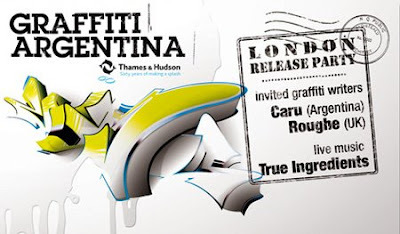 Barcelona will host the first edition of the event at RAS library, followed by the UK premiere at the Pure Evil gallery in London, where the special guest Argentine artist Caru along with UK artist Roughe will join forces to make an original abstract graffiti piece. The event kicks off at 7pm on Friday 27th March 2009 with DJ Fenna Rhodes and hip hop band True Ingredients in charge of the night’s beats. This is a free event.